Is Canyon a painting or sculpture? 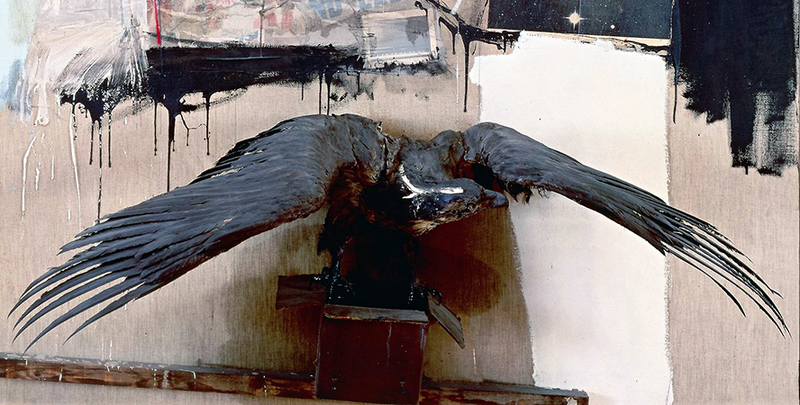 Its upper half is a mass of materials that include bits of a shirt, printed paper, a squashed tube of paint, and photographs all seemingly held in place by broad slashes of house paint, while its lower half consists of a stuffed bald eagle with outstretched wings about to lift off from an opened box. The box seems to balance precariously upon a beam that tilts downward to the right; its end point meets the frame. As if that were not enough, that beams suspends a pillow dangling below the frame and squeezed in half by the cloth string that holds it. 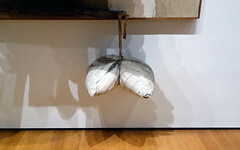 Canyon belongs to a group of artworks called “Combines,” a term unique to this artist who attached extraneous materials and objects to canvases in the years between 1954 and 1965. 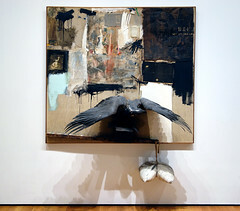 What makes Rauschenberg so significant for this period—the postwar years—is how he challenged conventional ways of thinking about advanced modern art; especially the art of “The New York School,” a group of émigré Europeans and like-minded American artists (including Jackson Pollock, Willem de Kooning and their followers), who were praised for their heroic abstraction. Rauschenberg’ s art violated the rules. Canyon is not an entirely abstract work of art. But what exactly is the subject matter? On the face of it, it seems to be a wryly comic re-telling of the Greek myth in which the god Zeus, disguised as an eagle, abducts a youth named Ganymede. The subject had of course appeared in art before. There are, for example, Greek vases, Roman reliefs and European oil paintings dedicated to this story. 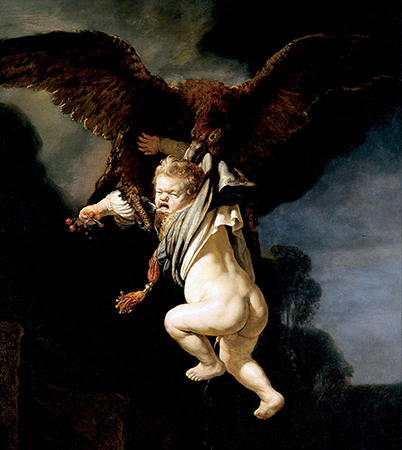 Rembrandt’s Abduction of Ganymede, 1636—to which Rauschenberg’s version might readily be compared—paints the story in the lurid richness of oil with a dramatically diagonal arrangement of the figures. Or could it even be a reference to the “scales of Justice” so often found in the art and architecture of Europe and America? It would be a mistake to read Canyon narrowly using only conventional iconography. 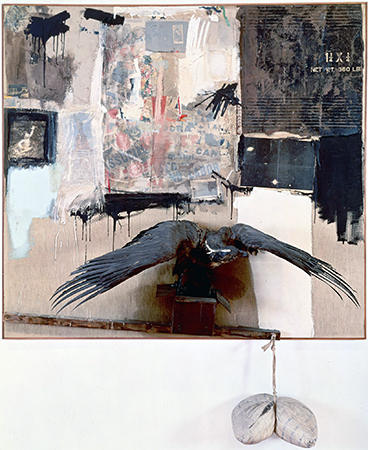 Although some art historians have sought to “read” Canyon as one would a traditional representional artwork, Rauschenberg’s work seems to resist fixed decoding in favor of a more open-ended play of meaning. 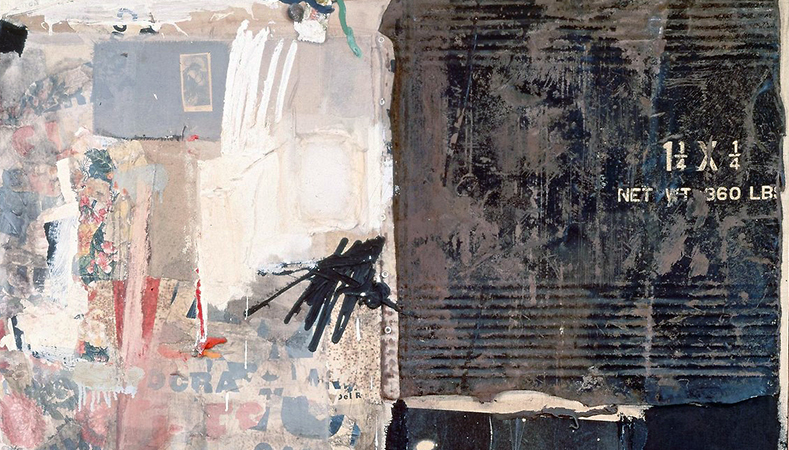 Rauschenberg combined disparate elements in a random fashion perhaps responding to his urban environment (New York City) and a world of ephemera: the flotsam and jetsam of mass culture in the years after the Second World War. Look, for example, at the top right: here is a slab of cardboard with commercial lettering, probably the discarded packaging for a shipment of goods found on the street in his lower Manhattan neighborhood. In this sense he anticipated the later work of Pop artists such as Andy Warhol, Roy Lichtenstein and James Rosenquist who would, a few years later, make such commercial imagery the focus of their art. Rauschenberg did know other artists who took a similar approach and challenged the narrow parameters of the formalists wing of the New York School and its rejection of popular culture and illusionism. His immediate circle included the painter Jasper Johns, the choreographer Merce Cunningham and the avant-garde composer John Cage. On the West Coast Edward Keinholz and Wallace Berman were creating artworks that would come to be called “Assemblage”—think collage on a large scale. In Paris, Arman, Jean Tinguley and Jacques de la Villeglé incorporated the debris of the city; junk and cast off commodities incorporated into artworks that became know as Nouveau réalism (New realism). 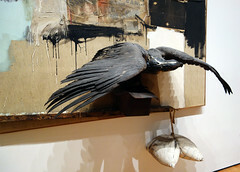 Rauschenberg’s self-conscious handling of paint intertwined with often-outrageous objects can be construed as parody. In this way, Canyon can be seen as a counter to the overblown rhetoric of abstract expressionism with its stress on heroic individualism and the formal purity of abstract art. 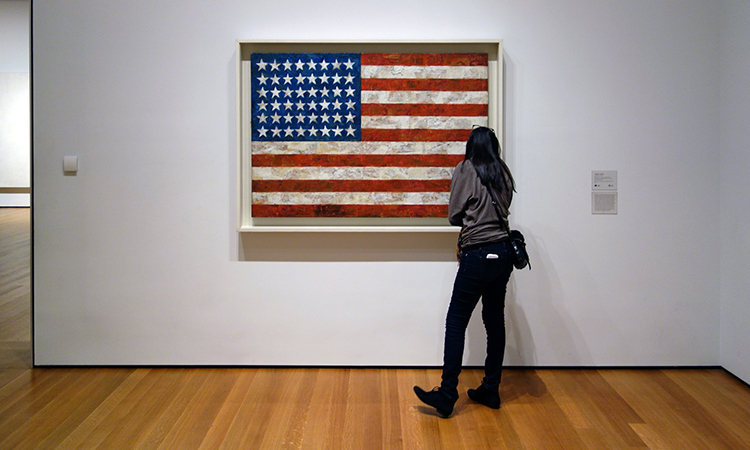 The eagle (with its testicular appendage hanging below the frame)—like Jasper Johns’ American flag (see above) from the same period—may be an ironic commentary on heroic masculine identity and even cold-war era American power. As a gay artist during a deeply repressive era that sought to expel both the threat of communism and of homosexuality, Rauschenberg distanced himself from cultural orthodoxy. 1. Clement Greenberg, “Avant Garde and Kitsch,” (1939), Art And Culture: Critical Essays (Beacon Press: Boston): 5. 2. Dorothy Seckler, “Oral history interview with Robert Rauschenberg,” 1965 December 21. 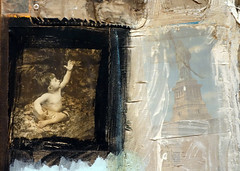 Smithsonian Archives of American Art. 3. Leo Steinberg, “Other Criteria,” Other Criteria: Confrontations with Twentieth-Century Art (New York: Oxford University Press, 1972): 90. Cite this page as: Dr. Tom Folland, "Robert Rauschenberg, Canyon," in Smarthistory, August 9, 2015, accessed April 21, 2019, https://smarthistory.org/robert-rauschenberg-canyon/.